HATD in the spotlight—across the divides! Home / Latest News / HATD in the spotlight—across the divides! Healing Across the Divides has made a splash in both Palestinian and Israeli media in recent months, featuring the important impact HATD-funded programs have had on the communities they serve. HATD representation in the media has notably spanned political, geographic and linguistic divides, with mention made in print, radio and television spots in Hebrew and Arabic that reflect HATD’s true “cross-divides” presence. “Healing”—as HATD is aptly referred to locally by Palestinians and Israelis—was cited proudly as the backer of the award winning Beterem child safety program in two recent radio interviews. The interviews, broadcast in Hebrew on Israel’s popular Reshet Bet radio station, highlighted the prestigious Knesset award granted to the program’s participants for their outstanding service. 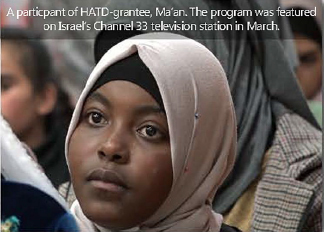 Other HATD-grantee publicity in recent months included a half-hour television interview on the Maan Palestinian television network with Mr. Issam Jwiahn, Director of HATD-grantee Al-Maqdese. Healing Across the Divides was also recently lauded for its “pioneering role” in the treatment of diabetes in the West Bank and for its support of Palestinian diabetics, according to a report in the West Bank based Asdaa Press. Multiple radio spots were broadcast throughout southern Israel on Kol HaDarom radio station in November as part of a broad campaign to help end violence against women by HATD-grantee Ma’an. ln March, Ma’an was featured on Israel’s Arabic-language Channel 33 television station. The organization, funded by HATD for the past three years, is focused on ending domestic violence against Arab Bedouin women and girts in southern Israel. Send Healing Across the Divides an email and we'll get back to you asap! I consent to HATD collecting my details through this form.